Seed packets rarely provide the basic seed-starting information a gardener needs to know. The packet usually won’t tell you whether the seeds should be started indoors under lights, or should be planted right in the garden. You won’t be told if the seeds need light or darkness to germinate, or if the seedlings are frost hardy. These days, with so many unusual varieties available from seed, you may also wind up purchasing seeds for something exotic, like the Himalayan Blue Poppy (Meconopsis betonicifolia) that even a highly experienced gardener would have difficulty bringing into flower. To ensure your success right out of the gate, start with some of the super-easy seeds (Sunflower, Marigold, Morning Glory, Bachelor Button Zinnia, or Calendula). Give yourself a year or two with these foolproof favorites before you venture into growing some of the more challenging annuals in the next list. What size are the seeds? This may seem like a peculiar concern, but if you’re going to plant your flower seeds directly into the garden, or put individual seeds into peat pots, the seeds need to be large enough to handle. Dust-like seeds (such as Petunias and Snapdragons) will get lost if you try to direct-sow them (plant them right into the garden). Are there any special germination requirements? Though most seeds prefer to germinate in darkness, some require the lights on. Sometimes seeds (such as Lupines, Sweet Peas and Morning Glories) have very tough seed coats and should be soaked or nicked before planting. Some seeds will also take their time germinating. While most will be up in four to 7 days, for some it’s normal to take 3 to 4 weeks to get going. How rapidly will the seedlings grow? This is a tricky one because growth rate is genetically programmed, but is also influenced by growing conditions. Plants grow much more rapidly in an 80 degrees Fahrenheit (27 degrees Celsius) greenhouse than under a grow light in a cool basement. Some annuals, such as Impatiens, will be a good size for transplanting when they’re about 8 weeks old. 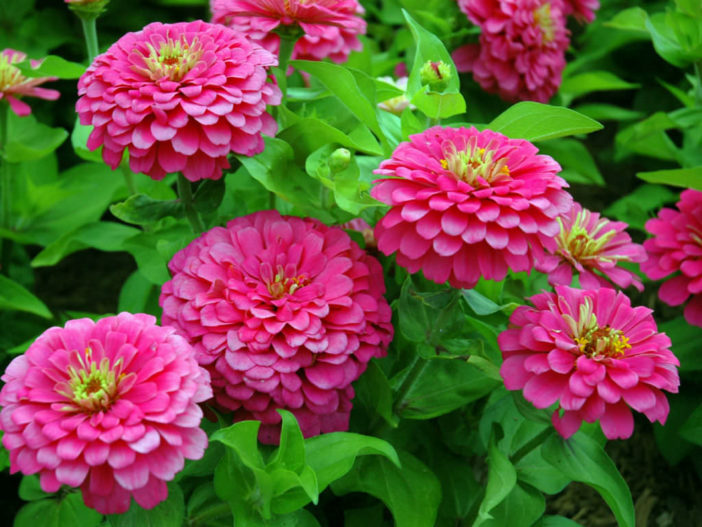 But if you start your Zinnias eight weeks before transplanting, they’ll be root-bound and too tall by the time they go into the garden. Most gardeners sow fast-growing annuals, such as Sunflowers, Bachelor Buttons, Calendulas, Zinnias and Nasturtiums right into the garden. I agree that it’s not worth the trouble to grow these seeds indoors for just 3 to 4 weeks, and also run the risk of transplant shock. How long will it take from germination to bloom? The seed packet should tell you how many “days to bloom”, which means how long it takes from germination to flowering. If you have a short growing season and the packet says it will be 80 or 90 days to bloom, you will need to start the seeds indoors if you want to see them flower for a couple weeks before frost. The easiest annuals to start from seed usually come into flower very quickly, often blooming just 50 to 70 days after planting. How cold-hardy are the plants? Seeds of hardy annuals can be planted directly in the garden as early in the spring as the soil can be worked. Once the seeds have germinated, the young plants will usually tolerate a light frost and temperatures down to about 25 degrees Fahrenheit (-4 degrees Celsius). Half-hardy annuals can be started indoors 6 to 8 weeks before transplanting, or planted right in the garden once the soil has begun to warm up. Most will tolerate a light frost, but be prepared to protect young seedlings if temperatures drop. Tender annuals can be sown directly in the garden, but only after all danger of frost has passed. These cold-sensitive seeds can also be sown indoors 4 to 6 weeks before the last spring frost date. Transplant into the garden when you are confident that nighttime temperatures will stay above 40 degrees Fahrenheit (5 degrees Celsius). If you are interested in starting lots of annual flowers from seed, consider investing in a seedstarting reference, such as Eileen Powell’s excellent book: The Gardener’s A-Z Guide to Growing Flowers from Seed to Bloom. This book describes more than 500 different types of flowers and how to grow them. You’ll find important information about germination requirements, plant hardiness, time to bloom, etc. The more you know, the better you’ll grow.